Elimiate guessing with the all New Google Analytics. Discover. Share. Act. Google Analytics makes it easy to get results online. Write better Google ads, strengthen your online marketing initiatives, and create higher-converting websites. 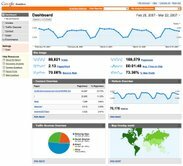 Google Analytics, Crank IT specialise in the setup and optimisation of Google Analytics reporting.